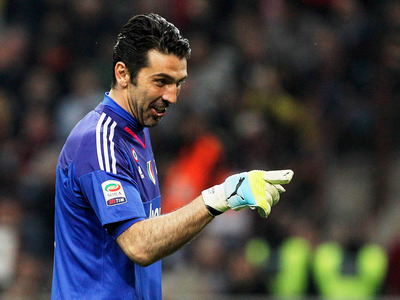 Marco Luzzani/GettyGianluigi Buffon denies himself pasta and wine each week. Italian goalie Gianluigi Buffon will look to add to his decorated resume at the European Championships this June, one of the few accomplishments that has escaped his grasp. Otherwise, Buffon is one of the legendary goalies in soccer, a winner of several individual awards to go with five World Cup appearances, including a win in 2006. So how has Buffon managed such a lengthy, successful career, particularly on a surgically repaired lower back? He told Wall Street Journal’s Joshua Robinson that “rage” has fuelled his career. And to fuel that rage, Buffon has had to make sacrifices, particularly on the nutritional end. As Robinson notes, Buffon may have had to make the biggest sacrifice an Italian athlete can make: pasta and wine. It’s important to note that Buffon’s logic is not similar to the logic of nutrition-conscious athletes like, say, Tom Brady. Brady refuses unhealthy foods to help with recovery time and avoid inflammation. Doing so has helped extend his career. Buffon appears more interested in the mental aspect of it — deny himself his ideal amount of pasta and wine, and he’ll be burning up when he’s on the field. If he helps Italy with the European Championships for the first time in his career, the dietary sacrifice will be worthwhile.